The Romans were great conquerors and builders. 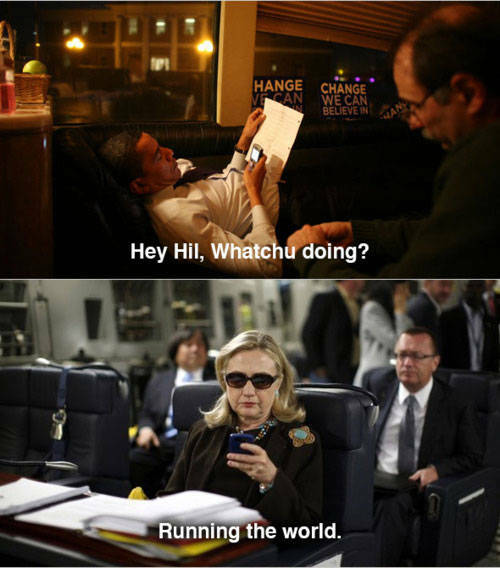 Their contributions to human civilization are unparalleled. One of the areas they particularly excel is leisure and recreation. Here are some of the ancient Roman sports that were played in all the territories of the Roman Empire at the height of its power. The first three games on the list are bloody spectator sports while the rest are more benign board games and playing stones, some of which served as model and inspiration for modern games that we still play today. 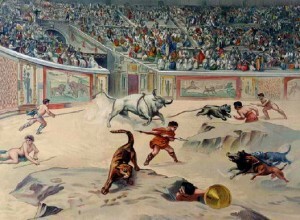 Gladiators or professional fighters found each other, wild animals and slaves in front of an arena full of spectators. Though originally from the Etruscans, gladiatorial games were adopted by the Romans for their entertainment. These public spectacles were often fought to the death. 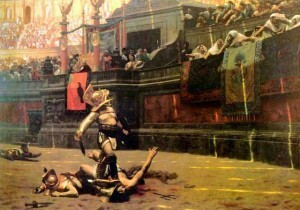 Though these bloody games were fought in small arenas of nearly all the cities and provinces of the Roman Empire at that time, the Emperor would stage gladiatorial games for the benefit of the public as part of a series of public entertainment that also featured chariot racing, public executions of criminals, and theatrical performances. Gladiators could die during the fight or in some instances a thumbs down from the audience or the Emperor himself could seal his fate. 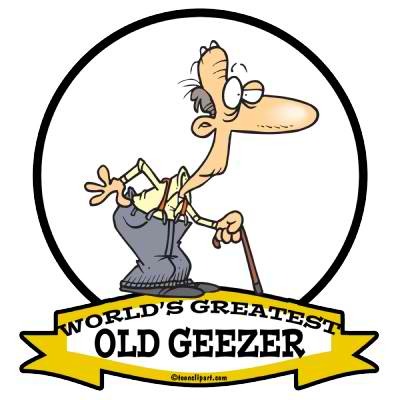 Some gladiators live long enough to retire, and leave the arena to train new blood. 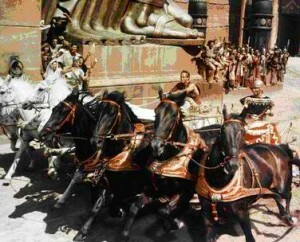 The top chariot drives of Ancient Rome were venerated by the public as much as modern day sports fans adore their respective sports heroes. These drivers may either be professionals or slaves. When they win the race they are rewarded with currency and prestige. And the amount of betting that goes involves huge amounts of money. Skilled drivers could control a team of four horses (a quadriga) or more. Chariot races in the Roman Empire were always exciting, especially when tumultuous crashes involving chariots and horses are involved. 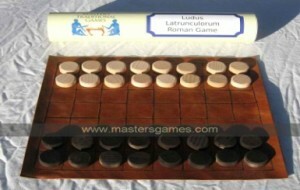 Ludi or public games in honor of religious festivals were sponsored by important Roman officials. These spectacles are organized annually for the benefit of the public and in honor of the gods. There were also triumphal ludi sponsored by victorious Roman officials as a fulfillment of a pledge or vow to a particular god. A ludi may last for one day or several days and includes a variety of entertainment such as plays, parades, athletics, chariot racing, and gladiatorial games. I Rome, the Circus Maximus is the largest stadium of the Empire and was designed to accommodate as much as 150, 000 people. It was the most popular venue for ludi during the height of Roman power. 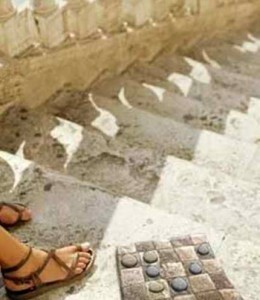 Calculi or Ludus Calcorum (the game of stones) is considered by modern scholars Roman Checkers, despite the fact that not all boards used in the games were checked in black and white. It is also called “Five in a Row.” The association was made due to similarities in the game pieces and the board itself. The stones used to play the game were found in archaeological digs in ancient Roman cities and settlements. To win the game, one must be able to line up five stones successive stones diagonally or orthogonally. The player with black stones lay down the first piece. If the board is filled and nobody wins, the game is considered a draw. The Ancient Romans were very enthusiastic about their game of dice, tesserae, and another form of the game called tali. The Roman game of dice is very similar to the modern way we play dice where we use two pieces, shake them up in a cup and toss them out. Tessarae was played everywhere—on the streets, in brothels, and in the Imperial Palace. The Ancient Romans loved gambling as a rule and aside from dice, they would gamble with coins, Senet sticks, or knucklebones. The Romans gambled too much that it was eventually restricted and gamblers caught gambling were asked to pay a fine or penalty. However, the restrictions did not include betting on gladiatorial games and chariot races. Despite the association with Tic-Tac-Toe, the Terni Lapili of the Ancient Romans does not include X’s and O’s, but markings on the walls, roofs, and floors have enough similarities with the modern Tic-Tac-Toe. However, there are more differences than similarities that scholars suggest that Terni Lapili be considered a separate game altogether. Not much is known about how this ancient Roman sports is played other than it’s one of the most popular board games in Ancient Rome as shown by the archaeological evidence. 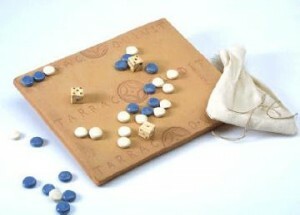 Latrunculi, loosely translated to “mercenaries,” was another very popular board game in Ancient Rome. It is a game of strategy similar to chess though checkerboards were not used and the rules are not exactly known. The boards used varied in size, from 9 x 10, 8 x 8, or 8 x 7 though it is generally agreed that the size does not affect the game and neither does the material that the board is made, whether marble, stone, wood, or precious metals such as silver. The favorite material was marble. The pieces may be made from stone, ivory, glass, or metal. The less affluent would sometimes just use coins. It is generally believed that this game was based on the Greek game called Petteia in the 5th century. 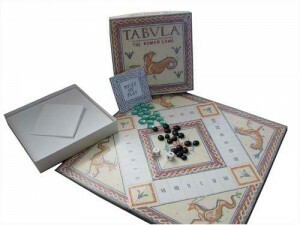 From its original name, Alea (gambling), this board game was eventually called Tabula and is said to derive from the Game of Twelve Lines and is also similar to Senet, a popular game from Egypt. This game was a favorite among the Roman Legion. Lucky Sixes involves a board that contains six letters or words. Some speculate that the letters on the board were used to disguise the game since gambling was restricted. 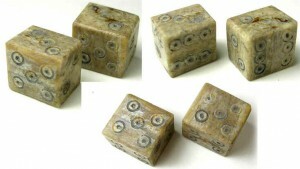 At an archaeological dig, a board was found with 15 pieces each of white and black and 5 dice. It is believed that three dice were generally used in the game. This game is said to influence other games such as Lucky Sixes. The pieces are moved based on the result of the throw of the dice. And the goal is to get one’s pieces (a total of 15) all across the board. Some scholars think that this game was an extension of Lucky Sixes. For most the reason for the game’s name is unclear since there are no 12 lines on the board to suggest it. These board games and spectacle games from Ancient Rome may or may not have significance in our modern lives. But these ancient Roman sports still play an important part in the history of human civilization and give us a unique perspective on the activities that people engage in for leisure and recreation.